Haitian festival commemorates anniversary of the earthquake with art exhibits and dance. Watching the West Indian Folk Dance Company perform at the University of Chicago I-House on Wednesday night, one can’t help imagining what would happen if the dancers relocated to the center of the main quad. Certainly the pulsating drumbeats, spirited singing, and bright costumes could inject some life and color into the heart of campus on a dreary winter afternoon. Characteristic of music from that region, the West Indian Folk Dance Company projected a contagious ebullience, which could provide the student body with some serious uplifting halfway through winter quarter. Part of Haiti: Culturally, an exhibition of Haitian artistic culture, the performance was the ending act to an afternoon of visual art, and corresponded with the anniversary of the 2010 earthquake that devastated much of Haiti. 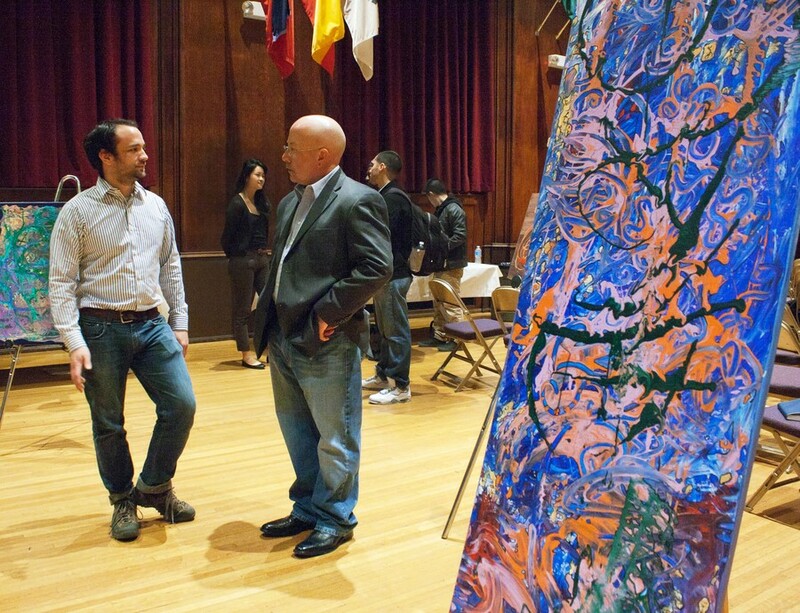 Paintings from the Jacmel neighborhood of Haiti were displayed in the performance space. They were abstract yet skilled and colorful compositions showcasing the remarkable artistic potential of the Haitian community. The featured visual artists were Prince Luc, an artist whose work has been shown extensively in Haiti, as well as in the United States and France; Rose-Marie Lamour, and Riccardi Jules. Lamour’s work focused on the many facets of Haitian life, according to a press release, from “the pastoral beauty and tranquility of the countryside to the spiritual depths of Haitian Vodou,” while Jules, a painter and sculptor from Haiti who now lives in New York, drew his inspiration from abstractions and the realities of Haiti. “My inspiration derives from the intersection between the colors and sounds I grew up [with], and modern art,” Jules said. Lauren Eldridge, a graduate student in music who organized the event, initially decided to do the exhibition when she was conducting field research in Haiti in August. “The stories [of these artists] are amazing, and their art is far more abstract than I expected,” Eldridge said. The West Indian Folk Dance Company’s performance was particularly vibrant—an explosion of color and sound. The music, performed by three drummers, provided rhythm and strength for the playful dancers. Six women outfitted in bright ruffled dresses swayed sinuously to the drumbeats, while two male dancers bounded across the stage. Their dances were light-hearted, playful, and sometimes suggestive, but always elicited cheers from the audience. The songs, performed by the drummers and two backup singers, conveyed the joy in simple pleasures found in the West Indies; one of the liveliest songs, “Crayfish,” eulogized the morning routine of going to the marketplace. Attendee Sabine Cadeau, a graduate student in Caribbean history, is from Haiti and appreciated the positive exposure of Haiti’s culture.